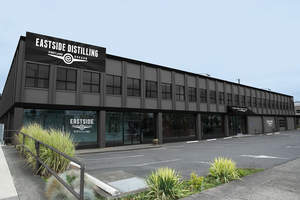 PORTLAND, OR--(Marketwired - Jan 15, 2015) - Eastside Distilling, Inc. (OTCQB: ESDI), an innovative and fast-growing premium producer of master crafted spirits has begun the build-out of its new 41,000 sq. ft. facility on Portland's Distillery Row. Scheduled to become operational in the second quarter of 2015, the facility will house the largest distillery for master crafted spirits in the Pacific Northwest. The layout of the existing building covers 27,000 sq. ft. of operating space on the ground floor, with another 13,000 sq. ft. on the mezzanine. This compares to the company's current 2,500 sq. ft. facility that has been running at near capacity. The expanded space will receive new state-of-the art distilling, bottling and packaging systems designed to expand Eastside's production capacity from about 6,400 cases annually to up to 1 million cases. It will also support the development and rollout of upcoming additions to Eastside's product line, including specialty gin and the much anticipated release of the company's American Whiskey. A new, flagship Eastside Distillery tasting room will also be part of the new facility, building upon the success of the company's original distillery tasting room located nearby as well as its new location at the Clackamas Town Center Mall. Local customers and tourists will be able to enjoy samplings of the company's spirits in a comfortable, relaxed atmosphere, and then stock up on their favorites by purchasing directly from the distillery. "This new distillery and tasting room will reflect our passion for creating premium, master crafted spirits," stated Steven Earles, CEO of Eastside Distilling. "It will provide the additional capacity needed for continued growth, as well as deliver favorable economies of scale as we expand." The new tasting room will be the largest of its kind on Distillery Row, and will include a members-only VIP area with special access to monthly parties, special events, in-house concerts, and exclusive tastings of upcoming new products. While delivering an all-important superior customer experience, the direct sales anticipated to be generated by Eastside's tasting rooms represent a key component to the company's business model. Direct customer interaction also helps sales because of the unique tasting profiles featured in the company's spirits, like its Cherry Bomb Whiskey that is infused with real Oregon cherries or its Below Deck Coffee Rum enhanced with the flavor of locally-roasted Arabica coffee beans. Both products have received industry accolades, with Cherry Bomb awarded the prestigious Gold Metal from the American Wine Society in 2014 and Below Deck Rum winning the Silver Medal at the 2011 World Spirits Competition. "Experiencing our award winning spirits first hand inevitably leads to amazed customers, and this positive experience builds a loyal following," said Earles. "We anticipate continued success as we launch our new national sales and marketing campaign." While the new facility is under construction, the company's original location at 1512 SE 7th Ave, Portland, will continue to offer tastings and events seven days a week, from 12 p.m. to 8 p.m. Sunday through Thursday, and noon to 10 p.m. Friday and Saturday. Eastside Distilling, Inc. (OTCQB: ESDI) has been producing high-quality, handcrafted spirits since 2008 and is located in Southeast Portland's Distillery Row. Makers of award winning spirits, the company is unique in the marketplace and is distinguished by its highly decorated product lineup that includes Burnside Bourbon, Below Deck Rums, Portland Potato Vodka and a distinctive line of infused whiskeys. All Eastside spirits are master crafted from natural ingredients for unparalleled quality and taste. The company is publicly traded under the symbol OTCQB: ESDI. For more information visit: www.eastsidedistilling.com.